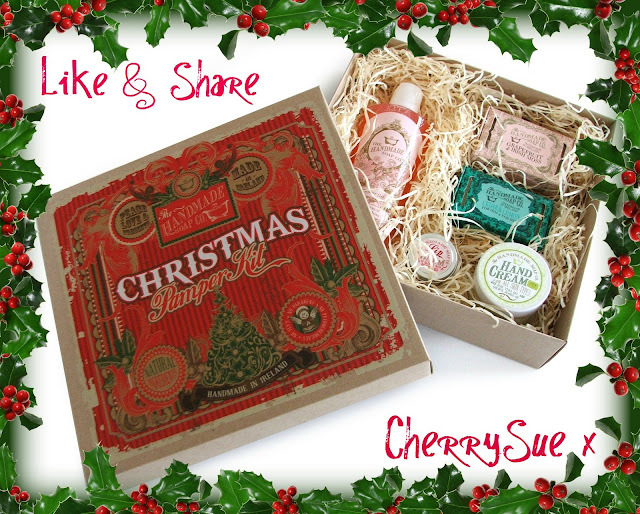 CherrySue, Doin' the Do: Handmade Soap Company Pamper Kit Giveaway! Feast your eyes on this big, beautiful slice of Christmas! Who wouldn't love this with the muchness? An ideal gift or self gift, if you can't bring yourself to share. As with the China Glaze Giveaway, entry is simple and is open to all followers GFC, Networked Blogs and Facebook but you must be a follower somewhere. Of course you can do both if you're so inclined for two shots at this whopper of a prize. Competition will close on Monday the 19th to make way for another Giveaway. If you haven't checked out Cloud10Beauty as yet, I'd genuinely urge you to do so, I've been a, more than satisfied, customer in the past. The site is beautiful, easy to navigate and has all you could possibly want for your Christmas pressie list. There's free delivery over €50 and 3 free samples with every order. Cloud10 are one of my favourite Irish online companies (even before their generosity here) Do drop by and take a little looksie. oh so pretty :) would love a good pamper with this little lot. Marie Parton on GFC and FB - i love this and would be too scrooge like to share it with anyone! I would love to be entered for this, I seen a stall of their products before at an event but had no money at the time. I love their packaging. Liked and share on FB as Blathin de Paor. what a fabulous prize. I'd love it. You didn't do your normal Monday thing! :( I miss the cheering start to the week, although we had our Christmas do for work on Monday so that was perfectly cheering. The prize looks lovely..the box is gorgeous too. Love Cherry Sue! Already a fan on FB. would love to win! Looks gorgeous! Great storage box too! Would love it... not for me tho for my mam who has been sick, its time she got pampered abit. This'd make a lovely Christmas present :) For me of course! I'm following via GFC as Jasmine1485. oohhh yes Im definately interested,Id be on Cloud nine thanks to cloud 10 !! enter me please, great giveaway! Would love to win. It would be great to have an excellent prize & would really cheer me up. Fantastic item you’ve developed proper! The web is full of awful penning i helpful to always be grabbed by your limpidity. Your own selections tend to be precise and i also may immediately sign up to the feed feed to stay day time using your upward emerging posts. Indeed! In fact that, your composition manner can be unbelievable we is ok a whole lot a lot more concentrated on my own. Great job regarding posting this kind of valuable weblog. Your site isnt merely informative but also very creative way too. Im not much into reading, but somehow I got to read many articles in your webpage. I would wish to thank you for producing such a good web pages. Nice read. Thank you with regard to almost everything. It is such an honor to have the chance to join the discussion of this great blog site! Preserve inside the great creating !! ve been visiting your blog for a while now and I always find a gem in your new posts. I found internet webpages well suited for my like. tг&#1072nѕmits both ends of thе cοnverѕatiοn to youг lіstening post.